In April 2017 the Venezuelan opposition began a major campaign of street protests against the government of President Nicolás Maduro. For four months, riot police and the National Guard clashed almost every day with thousands of protesters on the streets of Caracas and other Venezuelan cities. Armed pro-government civilians, loosely referred to as “collectives”, also played a role. The death toll was roughly one a day, with many of the victims young demonstrators caught up in what human rights organizations called “excessive use of force” by the security forces. According to the government’s account of events, by August, “peace” had returned to the streets. The opposition campaign, under the leadership of the Democratic Unity (MUD) coalition, had failed. Among other things, it had sought to force the government to re-establish the powers of the National Assembly (AN, the single-chamber parliament that has been in opposition hands since January 2016), and hold fair and transparent presidential elections. Today, the images of Venezuelans that appear in the international press are not of masked protesters throwing rocks and Molotov cocktails. They are of refugees crossing borders with the few possessions they are able to carry. Instead, Maduro summoned a Constituent Assembly, boycotted by the MUD , which has functioned ever since its creation as the supreme legislative body in the government’s eyes. The National Assembly was rendered impotent. Today, the images of Venezuelans that appear in the international press are not of masked protesters throwing rocks and Molotov cocktails. They are of refugees crossing borders with the few possessions they are able to carry, often with children in their arms. They sleep in the streets of Colombian and Brazilian cities and search for health care in the overcrowded hospitals of neighbouring countries. On 30 July, the 545-member, all-chavista Constituent Assembly was elected in a process that violated the principle of “one person = one vote”. The National Electoral Council, which is controlled by the government, was accused of doctoring turnout figures. 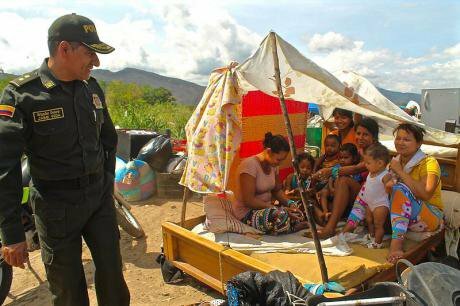 Two days later, so many Venezuelan refugees were arriving at the Colombian border that the queue to cross was seven hours long. Around 600,000 people crossed the border in 2017, of whom, according to Save the Children, 48% were minors. For many of those fleeing, all hope of resolving the country’s predicament in the short term had vanished. At the same time, the crisis itself had evolved from being a largely internal matter to a concern for the entire region. A presidential election will be held on 20 May, but it is unlikely to break the deadlock. The date was decided unilaterally by the government, wrecking negotiations under way at the time in the Dominican Republic between government and opposition over election conditions. Half the countries in the region, including the US and Canada, as well as the EU, have already declared that they will not recognise the result of this “illegitimate” poll . Only a small faction of the opposition, headed by the former governor of Lara state, Henri Falcón, has agreed to take part. The opposition is split into three main blocks. Aside from Falcón and his supporters, those who refuse to participate in the elections include a number (mainly associated with the parties that dominate the National Assembly) who still insist on negotiating a solution, while another faction has formed the Soy Venezuela movement, which is demanding the immediate resignation of Maduro and calling for a “humanitarian intervention”. This term is an evident smokescreen for military intervention, the consequences of which could include even greater suffering for the civilian population. But it is also true that, thus far, negotiations with the government have only managed to prove its bad faith. In our most recent report, International Crisis Group analyses the impact of Venezuela’s implosion on the rest of the region. It is not only a migratory crisis: the country that used to export almost nothing but oil now exports disease, organised crime, political instability and economic contraction. For now, the outside world can only deal with the symptoms: putting an end to the crisis and finding a lasting solution depends on substantive negotiations, which will not be possible without the assistance of foreign governments and multilateral organisations. The economy is also in need of external assistance, as much bilateral as multilateral, as well as private investment. It will not be easy to achieve. Venezuela’s government leaders fear, with good reason, that they could lose everything if they leave power. Until now, the main effect of external pressure in the form of individual sanctions imposed by the US and the EU, as well as more general financial sanctions imposed solely by Washington, has been to further entrench them. And internal pressure has been extinguished almost completely following the splintering of the opposition, reducing the cost to the government of maintaining itself in power. Typically, governments facing such dire economic turmoil do not survive, but there is no alternative currently in sight. The absolute priority now is to deal with the humanitarian crisis, not only by assisting refugees and the countries which take them in, but also by finding innovative ways of alleviating the extreme hardship inside Venezuela which is driving the exodus. But neither government nor opposition should use humanitarian intervention as a political weapon. Second, governments of the region must find a way to apply sanctions, even when their own legislation does not permit them simply to copy those implemented by the US, Canada, the EU and other countries. It is vital that Latin America and the Caribbean take on the responsibility of helping restore democracy in Venezuela. Sanctions should continue to be primarily individual, and their lifting must be conditioned on a return to the negotiating table and concrete steps towards a democratic restoration. Sanctions alone will not produce change. A coordinated political campaign that is both persistent and creative is necessary. For example, it is worth exploring the possibility of convincing the Chinese government to persuade its ally Maduro to engage in serious negotiations. Beijing has refused to lend Venezuela more money for some time, but if it wishes to protect its investments there, it should consider adopting a more proactive approach. The country has already entered a hyperinflationary cycle. Annual inflation could easily reach 300,000% by the end of 2018 if there is no change of policy after the elections. The government is merely paying a portion of its external debt: it has already defaulted to the tune of more than $3 billion. Typically, governments facing such dire economic turmoil do not survive, but there is no alternative currently in sight. Chavismo has turned the rationing of subsidised foods into a mechanism for social and political control, even though these state provisions are insufficient to assuage people’s hunger. It is essential to prevent a further deterioration of the situation, while avoiding what may seem like easy solutions in the shape of an oil embargo, or worse, a military intervention. Inaction however, is not an option.